If you are traveling a lot and have to move aircraft with large suitcases at airports of the world, it will be quite troublesome and tiring because of the distance between the terminal which is usually located far apart if you travel by foot. Now it can be overcome as a farmer in Hunan Province, China, named He Liang, offers his findings, the concept of "transportation with baggage", which is a suitcase that has a small engine to drive its three wheels. Two wheels in the rear with the countershaft and one wheel at the front of the steering wheel. Judging from the shape, it's like a regular suitcase, which is rectangular with a reasonable size for about a week traveling purposes. Different from the outside view is the little wheels on the bottom of that unique suitcase. Because of his findings, He Liang suddenly grabbed the attention from many international media such as Reuters, Guardian and BBC, Toronto News, China Topix, Getty Images, and YouTube pages also display it. 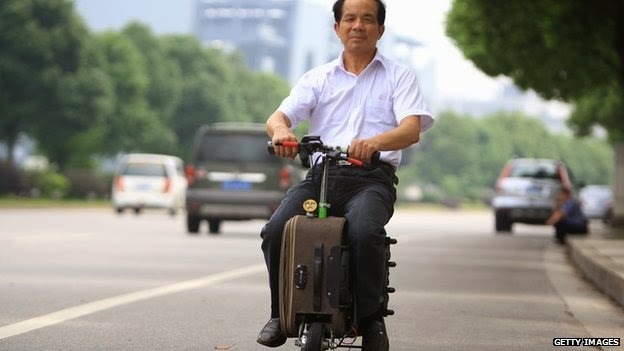 To use it, you simply sit on top of the suitcase, and hold the handlebar, and press the power on, then the suitcase that has an electric motor will be able to bring you up to speed of 20 kph (12 mph) as far as 60 km (37 miles) without needing to be recharged again its lithium ion battery. 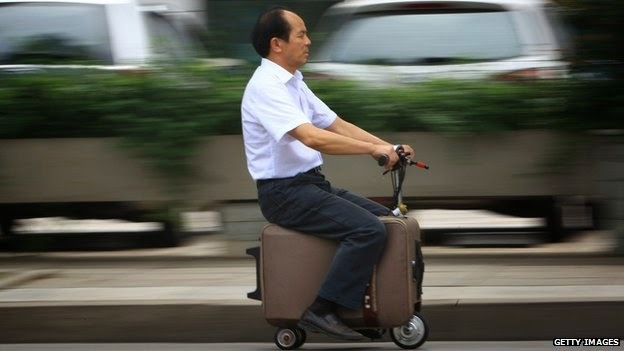 According to He Liang, the suitcase capable of carrying two adults simultaneously sit on it while driving. He thought of and designed the special suitcase since 10 years ago and inspired by the urban taxi so his special suitcase that has not been given named will combine the driving as well as bringing a large enough object carried in the hand. Like a regular suitcase, the suitcase that he created it remains capable of carrying the luggage you can reach even the empty weight of 7 kg (15 lbs). Generally in the United States today, free of charge baggage for international flights is 25 kilograms in total. However, the usefulness of the suitcase was not just in the airport environment alone, but can also be used in other environments. In fact, the Xinhua news agency reported that He Liang has prepared his luggage will installed tracker chip that can be accessed using the GPS. In other words, the owner can immediately know where the "magic suitcase" was located by using GPS.